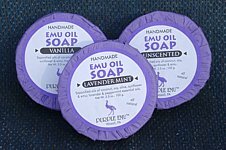 Purple Emu Emu Oil All Natural Handmade Bar Soap Lavender Mint 3.5 oz. Bar. Handmade all natural bar soap with added Emu Oil. A handcrafted, all natural skin softening soap. Available in Lavender Mint and Vanilla. Vanilla - Saponified Oils of Coconut, Soy, Olive, Sunflower & Emu; Fragrance Oils. Lavender Mint - Saponified Oils of Coconut, Soy, Olive. Sunflower & Emu; Lavender & Peppermint Essential Oils.